Vintage Swish was one of the first hats I did for Knit Picks Independent Designer Program. It's been one of my top sellers, and a hat that I have personally made at least 50 times. 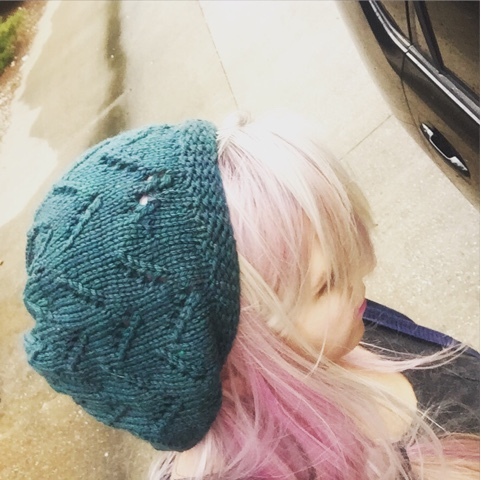 It's a quick knit, it's really easy to customize ( I have some slouchy versions with fewer repeats, or extra stockinette between the lace, multiple colors, etc)and it's pretty flattering for lots of different hair styles. However, while I love the design, there were things I didn't like about the way the pattern was written. Which is why, I took a week out of my schedule and reworked the pattern and had it test knit by some new knitters. I'm in love with it all over again and I'm so excited to relaunch it! Check out Vintage Swish HERE.